It is comprised of a unique set of proprietary tools and methodologies that our divisions use to structure and operate their businesses to maximize the performance, execution and value-add they provide to their largest and most profitable customers, and minimize the costs, complexity and distractions associated with serving small customers. 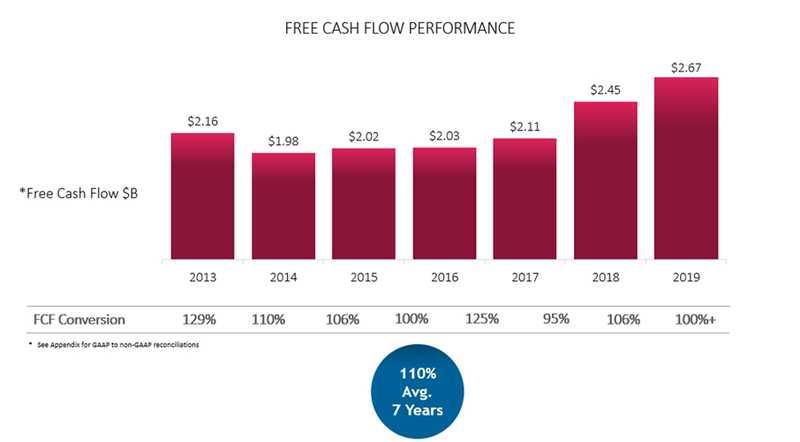 Through the application of ITW’s 80/20 Front-to-Back process, our divisions deliver best-in-class customer-facing execution, high-quality organic growth, and superior profitability and return on capital performance. 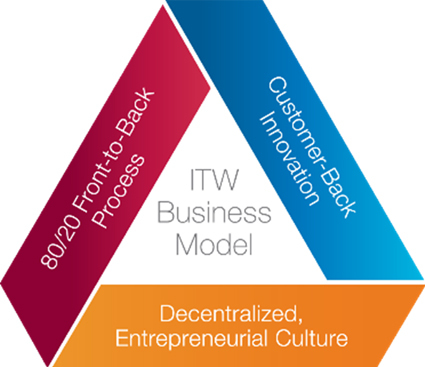 At ITW, we innovate from the customer back, not from the research and development center out. Our divisions partner with their key customers to create unique solutions that solve difficult technical challenges and improve business performance. The deep capabilities and creativity of our people is evidenced by our portfolio of approximately 18,000 granted and pending patents, including more than 1,700 new patent applications filed in 2018. Our people are clear about what is expected from them with regard to our business model, our strategy and our core values. Within this framework, we empower our business teams to make decisions and customize their approach in order to maximize the relevance and impact of the ITW Business Model for their specific customers and end-markets. Our people thrive in ITW’s “flexibility in the framework” culture, and think and act like entrepreneurs, they are accountable, and they deliver. The ITW Business Model is ITW's differentiating competitive advantage. It is the value we add from being part of ITW and we are committed to applying it with excellence everywhere in the company every day. 1. Portfolio Discipline: Operate only in industries where we can generate significant differentiated competitive advantage from the ITW Business Model over the long term. 2. Quality of 80/20 Front-to-Back Practice: Operate with excellence in the practice of ITW’s 80/20 Front-to-Back business management process everywhere in the company every day. 3. 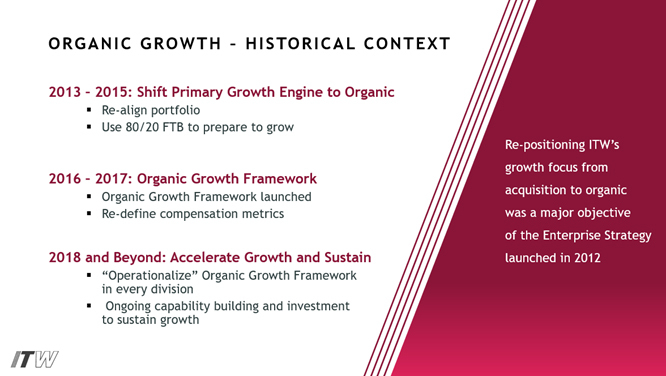 Differentiated Performance: Leverage the performance power of the ITW Business Model to consistently deliver solid organic growth with best-in-class margins and returns. We remain energized by the opportunity to take the company to its full potential and in doing so, clearly positioning ITW as one of the world’s best-performing, highest-quality and most respected industrial companies. •	They serve end-markets with strong and sustainable differentiated attributes where the performance of the products and services they develop and market is the dominant value driver for their customers. •	Their end-markets are supported by positive long-term macro fundamentals. •	They have strong and enduring competitive advantages relative to key market trends. •	They have significant potential to drive above-market organic growth over the long-term. Core to our enterprise strategy is our highly focused and disciplined approach to capital allocation. We invest only where we can leverage the ITW Business Model to create compelling competitive advantage and deliver sustained differentiated performance. We will not deploy capital in areas of opportunity that reside outside of our core capabilities. Internal investments to grow and support our highly profitable core businesses remain our top capital allocation priority. As a result, every internal investment that fits our strategy and meets our return criteria is fully funded. We allocate capital to discrete projects and strategies, not in lump sums to our businesses, ensuring that every investment we make is aligned with our business model, our strategy and our financial objectives. Our second priority is an attractive dividend, which we view as a very important component of our total shareholder return equation given the strong and consistent cash flow-generating attributes of our business model. 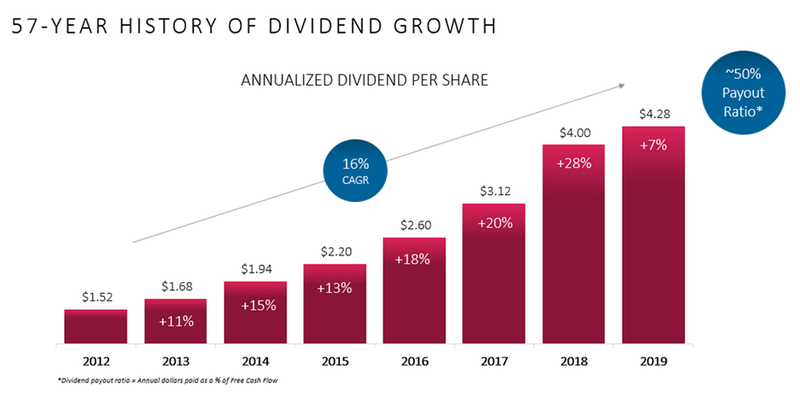 We have increased our annual dividend consecutively for more than 55 years, including a 28 percent increase in 2018, bringing the dividend to $4.00 per share on an annualized basis. While organic growth will remain our number one focus and priority, we expect that compelling opportunities to supplement our organic growth agenda with a high-quality strategic acquisition may emerge. Given the significant performance improvement capabilities embedded in the ITW Business Model, we would be positively disposed to these opportunities provided that they (a) expand the organic growth potential of one of our existing segments or provide us with an entree into a new industry that opens up an additional avenue of long-term profitable organic growth for the company and (b) can be acquired at a price that makes financial sense for the company. After funding these capital allocation priorities, we will continue to utilize an active share repurchase program to return any surplus capital to our shareholders. As we complete our “finish the job” agenda, we expect to generate 1-2 percentage points of additional organic growth and 3-4 percentage points of additional structural margin improvement at the Enterprise level.